Sara Willett graduated in 2002 from Camberwell College of Art, London, with a first class BA honours in Painting and later gained a Masters in Fine Art there; graduating in 2011. She exhibits regularly in the UK and Europe and Japan. 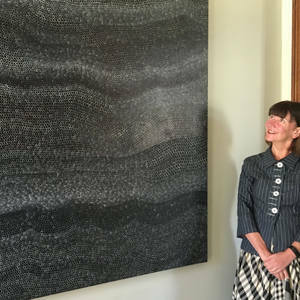 Her work is held in collections, in the UK, USA, Australia, Japan and Europe. She has been commissioned to create work on many occasions, most recently for the prestigious Depford X, London's largest contemporary art festival. Her practise incorporates, painting, installation, and sound. She has been awarded two fully supported residencies at the Da Wang Culture Highland centre, in South East China in 2015 and 2013. In 2016 she was awarded a fully supported residency with Being 3 Gallery, Beijing, which culminated in a solo exhibition, City Kaleidoscope. My works 'Beijing Mountain Dusk', 'Mood Indigo', A Thousand Li' and 'Spirit' have been shortlisted for the Sunny International Art Prize. 'Beijing Mountain Dusk' has also been selected for the Sunny Art Prize exhibition at their gallery, 30 Grays Inn Rd, London WC1X 8HR from 9th August - 4th September. My work will be shown at the contempory art exhibition and sculpture garden 'Art and Ducks' in Webridge, UK, where I will also create a site specific installation. 'A Walk in the Wu Tong Mountain' has been selected for the exhibition, '8 Studios from Here' part of the Deptford X festival 2013, Unit A104 / 6, Faircharm Estate, 8 - 12 Creekside, London SE8 3DX. 27th September - 6th October 12 − 6pm. Sara Willett and Alma Tischler Wood have completed the installation Razzle Dazzle Wall, at the Hill Station in Telegraph Hill, South London. Vice Chair of The Lewisham Arthouse, Artists run co-operative and community arts centre also leading community art projects. Currently organizing and running the graduate residence programme.